Each bubble represents a cosmic ray neutron penetrating the chamber. Left: Neutrons on board a flight from San Francisco to South Korea. Right: Neutrons detected while crossing the Atlantic Ocean from New Jersey to Brussels. Left: Neutrons detected while flying from Europe to Accra, Ghana. Right: Ground-level measurements in Ghana with giant ant mounds in the background. 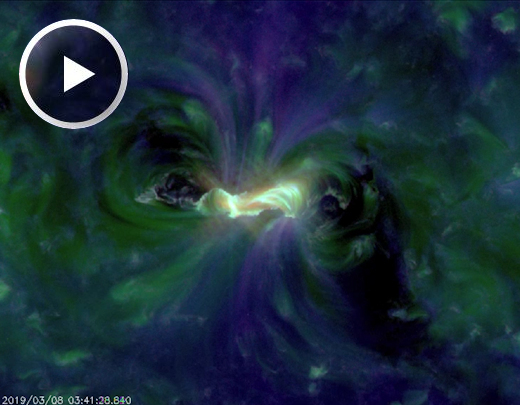 Above: This movie comes from SDO’s extreme ultraviolet telescope–hence the strangely beautiful colors. The explosion and its ultraviolet afterglow lasted for more than an hour. 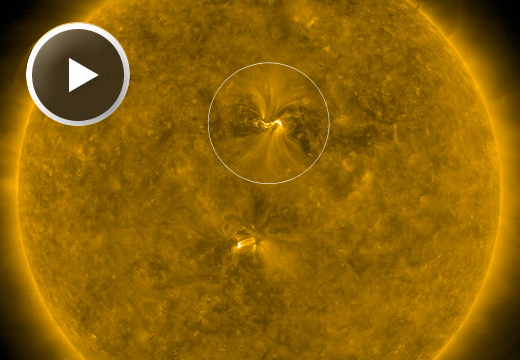 Such long-duration flares are notorious for producing “solar tsunamis” and CMEs. Indeed, in the global movie, below, a shadowy shockwave may be seen billowing away from the blast site like a ripple in a giant pond. That wave hurled two faint coronal mass ejections (CMEs) into space. NOAA analysts have modeled the eruption and reached the following conclusions: On March 11th, one CME will pass just behind Earth while the other passes just in front. Both could deliver glancing blows to our planet’s magnetic field. Minor G1-class geomagnetic storms are possible when Earth splits the gap between these two solar storm clouds. In recent months, geomagnetic storms have been caused mainly by streams of solar wind flowing from holes in the sun’s atmosphere. CMEs tend to be more effective instigators of geomagnetic storms and auroras. This is because of intense shocks and strong magnetic fields CMEs often contain. There’s no guarantee these CMEs will hit Earth. Just in case, Arctic sky watchers should be alert for bright lights on Monday night. Subscribers to our Space Weather Alert service will receive an instant text message when the CMEs arrive. Aurora Alerts: SMS text, email. During the eclipse, which lasted just over 4 hours, as much as 82% of the sun was covered. Technically, that makes it an annular solar eclipse, not total. At maximum, an annulus or “ring of fire” completely surrounded the Moon. The strange “double-dip” motion of the Moon across the sun is a result of orbital mechanics. Both SDO and the Moon are orbiting Earth, but at different speeds. SDO’s velocity of ~3 km/s is faster than the Moon’s velocity of 1 km/s. SDO thus overtakes the Moon first in one direction, then the other, during the long eclipse. Images like these have practical value to the SDO science team. The sharp edge of the lunar disk helps researchers measure the in-orbit characteristics of the telescope–e.g., how light diffracts around the telescope’s optics and filter support grids. Once these are calibrated, it is possible to correct SDO data for instrumental effects and sharpen images of the sun even more than before. However, not all Solar Minima are alike. The last one in 2008-2009 surprised observers with its depth and side-effects. 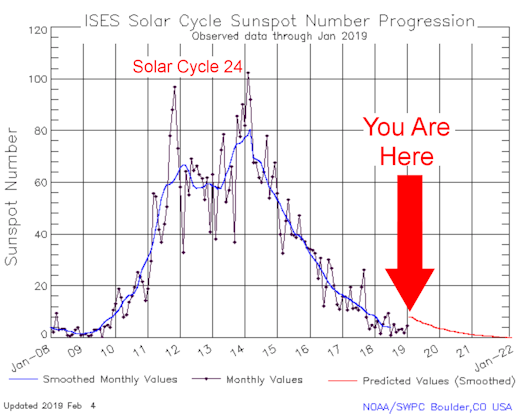 Sunspot counts dropped to a 100-year low; the sun dimmed by 0.1%; Earth’s upper atmosphere collapsed, allowing space junk to accumulate; the pressure of the solar wind flagged while cosmic rays (normally repelled by solar wind) surged to Space Age highs. All these things are happening again. What Kind of Sunspot is That? This is a magnetogram (magnetic map) of the sun obtained on March 5th by NASA’s Solar Dynamics Observatory. The sunspot is inset. Note how its magnetic field is almost orthogonal to other patches of magnetism elsewhere on the solar disk. Sunspots are islands of magnetism floating on the surface of the sun. Like all magnets, they have two poles, plus (+) and minus (-). Usually these poles are aligned almost parallel to the sun’s equator. Today’s sunspot is almost perpendicular. Could this be a sunspot from the next solar cycle? 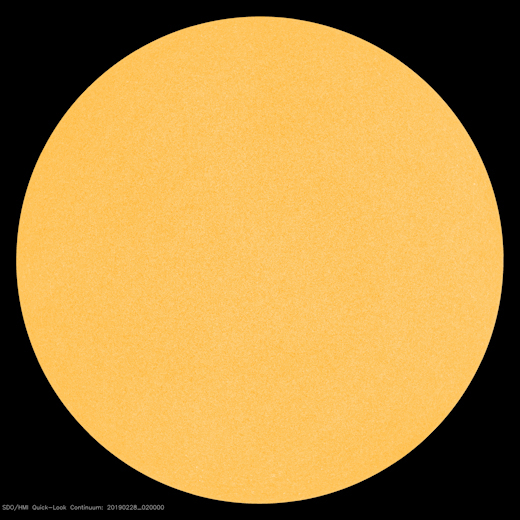 Right now, Solar Cycle 24 is decaying into a deep Solar Minimum. Solar Cycle 25 is still in the offing. According to Hale’s Law, sunspot magnetic fields reverse polarity between solar cycles. If this sunspot continues to grow–and if its magnetic axis tilts a bit to the right–Hale’s Law would tag it as a member of Solar Cycle 25. 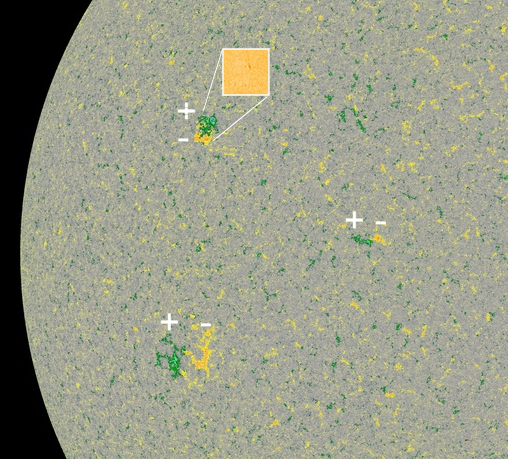 Postscript: The sunspot did continue to grow, and its magnetic field remained ambiguous. Based on its relatively low latitude, we believe it is probably a member of old Solar Cycle 24. These images illustrate recent findings about the physics of exploding balloons. In a Physical Review Letter entitled “Popping Balloons: A Case Study of Dynamical Fragmentation,” researchers from the Ecole Normale Supérieure in Paris report a series of laboratory experiments in which one balloon after another was popped and analyzed. Basically, there are two ways a balloon can pop: along a single tear (the “opening regime”) or along many tears (the “fragmentation regime”). This video shows the two regimes in action. Which way the balloon decided to pop depends on the stress in the rubber membrane. When the stress is low, it can be relieved with a single tear, but when the stress is high, many tears are required to do the job. Space weather balloons explode in the fragmentation regime, and the new research explains why. When space weather balloons are launched, they measure no more than 6 to 8 feet in diameter. By the time they reach the stratosphere, they have stretched into a sphere as wide as a house. So much stress requires many tears to release. More information about this research is available from the American Physical Society. 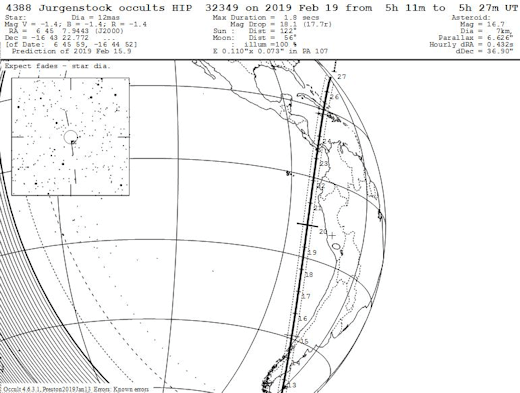 Sirius’s shadow will cross southern parts of Chile and Argentina, Central America and the Caribbean. This will happen on Feb. 18th between 09:11 pm PST and 09:27 pm PST. 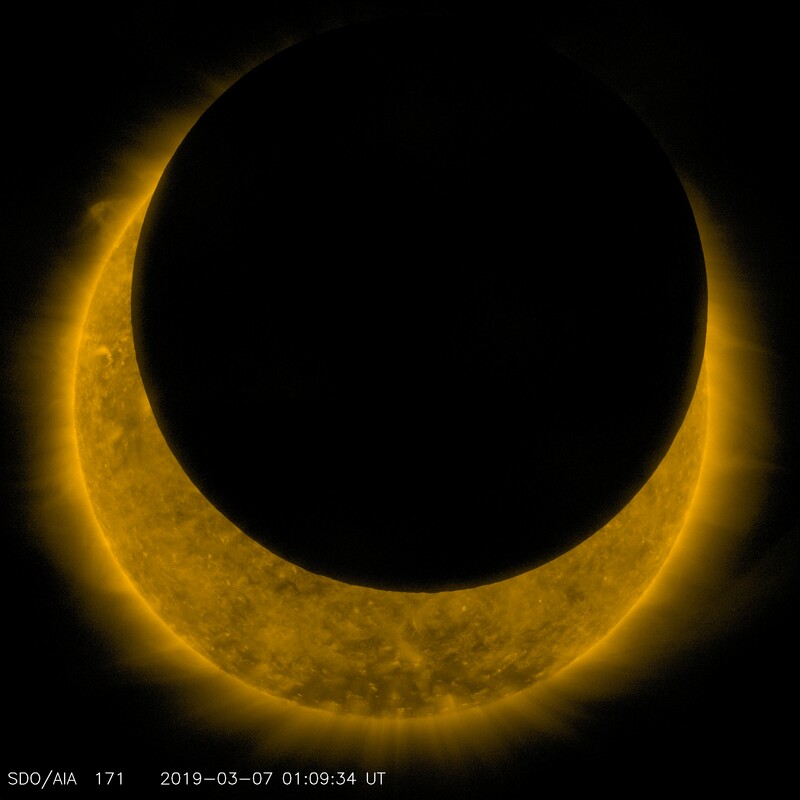 According to David Dunham of the International Occultation Timing Association, the eclipse could last for as much as 1.8 seconds, with Sirius fading to minimum brightness for 0.2 seconds of that time. The angular diameter of Sirius is 0.006 arcseconds. Asteroid Jürgenstock is just a little wider: 0.007 arcseconds, so theoretically Sirius should be completely blocked. “But the asteroid may be a little larger or smaller than predicted, and it’s likely to be irregularly-shaped, so there is a good chance that even at the center, the star will not completely disappear,” notes Dunham. Named after Venezuelan astrometrist Jürgen Stock, asteroid 4388 Jürgenstock orbits the sun in the inner regions of the asteroid belt between Mars and Jupiter. It is approximately 5 kilometers (3.1 miles) in diameter. 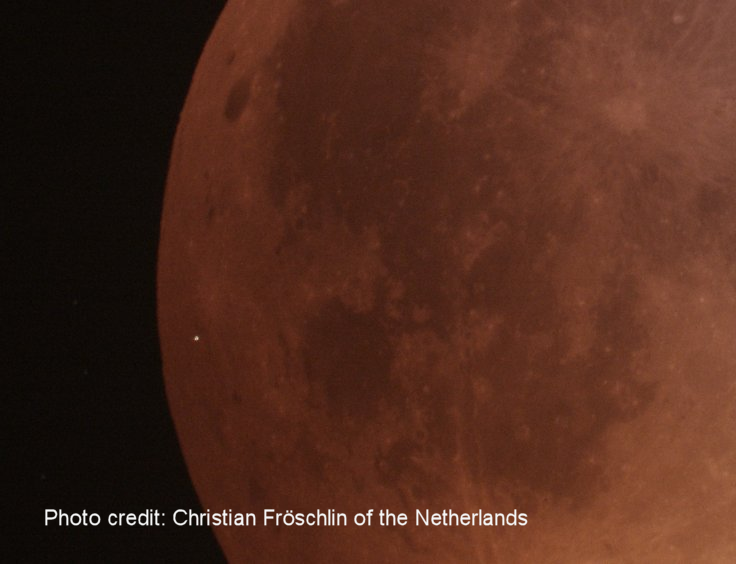 Video recordings of the eclipse could help trace the shape of the distant space rock. Resources: finder charts, observing tips, eclipse home page. Dozens of reliable images and videos of the impact have surfaced in the days since the eclipse. 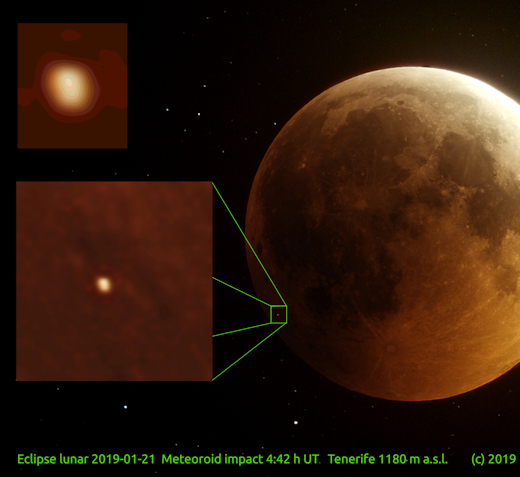 Analyzing one sharp image taken by Christian Fröschlin of the Netherlands, geologist Justin Cowart has estimated the selenographic coordinates of the impact site: 29.47S, 67.77W +/- 4km. This puts it just to the west of the lunar crater Lagrange H. NASA’s Lunar Reconnaissance Orbiter may be able to use such coordinates to target its cameras and photograph the crater. Meteoroids hit the Moon all the time. Literally. NASA has been observing impact flashes since 2005. Recently, other groups in Europe have joined the hunt. Flashes are typically recorded once every 2 to 3 hours of observing time. Impactors range in size from softballs to boulders, liberating energies equal to tons of TNT when they strike. 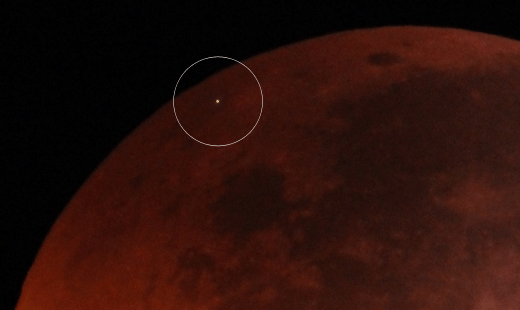 Readers, were you taking pictures of the eclipse around 04:41 UT? Check your photos. You might have captured an explosion. Submit images here. Jan. 16, 2019: Pick up your cell phone and look at it. That rectangular marvel of modern technology contains thousands of lines of code. Among them is the World Magnetic Model (WMM)–a program that helps your phone navigate. And it’s in a bit of trouble. Researchers have announced that the WMM needs an emergency update because Earth’s magnetic field is changing. The World Magnetic Model is a computer program that makes this correction for you. It improves the navigation of devices ranging from nuclear submarines to common smartphones. “The WMM is the standard magnetic model used for navigation by organizations such as NATO, the Ministry of Defence, and the US Department of Defense, and also by smartphone operating systems such as Android and iOS,” explains Will Brown of the British Geological Survey’s Geomagnetism Team, which produces the model in collaboration with NOAA of the USA. Normally the World Magnetic Model is updated every 5 years. For decades that’s been often enough to track natural changes in our planet’s magnetism caused by fluctuations in Earth’s molten core. But suddenly things are changing faster than before. Annual rate of change of declination for 2015.0 to 2020.0 from the World Magnetic Model (WMM2015). This information is about to be updated by a new WMM. “Since late 2014, Earth’s core field has varied in an unpredicted, and currently unpredictable, manner [including a sudden change in declinaton called a ‘geomagnetic jerk‘ in 2014/2015],” says Brown. “The aim of the WMM is to be globally accurate within 1 degree of declination, but we were going to exceed that limit in only 3 years.” That’s why, for the first time, they are issuing an update to the WMM before the usual 5 year mark in 2020. The new model is based data from a global network of 160 surface observatories and satellites in low-Earth orbit such as ESA’s Swarm mission. It was supposed to be released on Jan. 15th but has been delayed until Jan. 30th because of the partial shutdown of the US government.